Owned and operated by the city of High Point, Oak Hollow Golf Course shares a legacy with the likes of TPC Sawgrass, Kiawah Island’s Ocean Course, The Honors Course and Harbour Town — it was designed by famed architect Pete Dye. But tee times at Oak Hollow are much easier to make, and much easier to afford, if you get one. Completed in 1972, three years after Dye made a name for himself by designing Harbour Town — longtime home of the PGA Tour’s Heritage Classic — with some input from Jack Nicklaus, Dye laid out a beauty along Oak Hollow Lake. In addition to eight water holes, Dye utilized many of his famous trademarks, most notably small, undulating and peninsular greens, railroad ties and a memorable island tee. Though Oak Hollow isn’t as famous as Dye’s layouts that play host to annual PGA Tour events or occasional major championships its famous pedigree attracts players from throughout the country. “Certainly Pete Dye is famous and some golfers come here just because they want to play his golf courses,” said Steve High, director of golf at Oak Hollow and sister city course Blair Park. “We get people from everywhere — people on golf vacations to Pinehurst, Myrtle Beach or Florida stop here on their way. We’re almost like a tourist area. We get a lot of people from all over the state, and from all over the Southeast. And High Point has kept its Dye design pretty much intact, High said, pointing out that the biggest change he knows of is the replacement of a few weathered railroad ties. You don’t have to be 55 to get a great deal. The standard weekday price for greens fee and cart is $32 and $39 before noon on weekends. 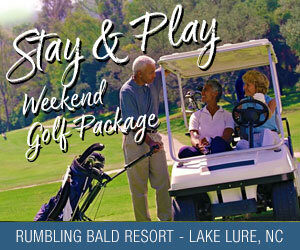 Walkers can play 18 holes for $17 on weekdays. And the rates drop in December, January and February. On the course, there is one major difference between Oak Hollow and some of Dye’s most dastardly difficult designs. Oak Hollow, which plays to par 72, isn’t extremely long, measuring only 6,564 yards from the back tees. But the small, sloping putting surfaces, water hazards and undulating terrain add difficulty that can’t be appreciated on the scorecard. And the challenges presented by the small, bent grass greens are increased by the shortage of easy pin placements. Approaches and chips left above the hole can often result in three putts. Yet Oak Hollow’s bent greens are smooth and true, providing good opportunities on uphill or flat putts. “We’re very comfortable with how they are now,” High said. Oak Hollow isn’t taxing throughout. At least two of the par-4s are reachable from the second tees. The two par-5s on the front nine measure fewer than 500 yards from the tips. As at many courses, local knowledge helps at Oak Hollow, especially at No. 2, a short par-5, where many players will hit drives over a hill, leaving only a mid-iron to a tiny green only 11 yards deep and protected by a pair of bunkers and sharp drop-off to the left. The imposing target makes laying up a reasonable option from less than 200 yards out. Oak Hollow Lake dominates the landscape, making its first appearance at No. 4 with a modest carry over the water required to the 170-yard par-3. The short par-5 fifth forces a carry over the water off the tee then stretches slightly left along the shore, with the lake eventually wrapping around the back of the green. The signature hole is the par-4 sixth hole, which presents a challenging drive from an island tee from the tips, and a heroic opportunity to drive the green from the other sets of tees, as it bends left around the lake. 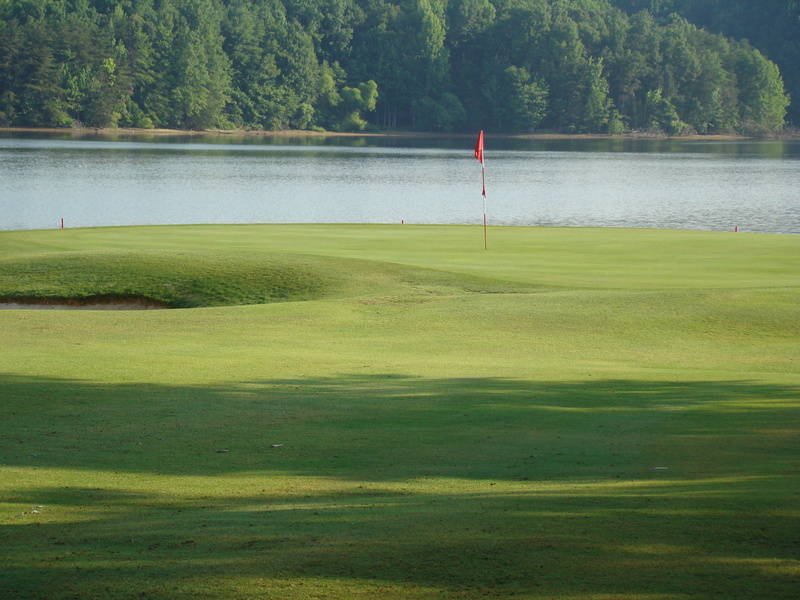 From the 420-yard back markers on the tiny island, players must avoid the water on the left and trees on the right to leave a mid- to short-iron approach to the putting surface. From the second tee blocks, players have the option of hitting an iron or fairway wood straight down the fairway, drawing a drive around a portion of the dogleg or taking direct aim over the lake — often into a prevailing breeze — to the green about 250 yards away. Turning away from the lake at Nos. 7 and 8, the course provides a classic Dye look at No. 9, a short par-4 with fairway tiers separated by railroad tees. Drives left of the target drop to a lowered landing area and an approach likely blocked by trees. The back nine is longer and slightly more difficult from the start, a 588-yard monster that forces players to hit two solid shots to have a clear approach as the hole bends sharply left over the final 100 yards. No. 11 is perhaps the most difficult hole on the course. Oak Hollow Lake extends down the entire left side on the par-4, which measures 437 yards from the back tees. Trees pinch in from the right at the green, which is only 14 paces deep. Going for the green in two at the 526-yard 15th hole takes steely nerves and superior skill with a fairway wood or long-iron. The small green sits upon a plateau with the left side of the putting surface perched precariously above a steep drop into a gully. At 17, players can try their luck at reaching the green 300 yards off the tee. But the putting surface is only 14 paces across, making it extremely rare for drives to come to rest on the putting surface. A long, accurate drive is a must on the finishing hole, a 448-yard par-4 bending left as the green approaches. Respectable drives to the left side of the fairway can be blocked from the green.